And a very good Banyule Festival was had by all…. Yes, it’s March and so it’s Banyule Festival again. And so there we were, all frocked up for Twilight Sounds at Sills Bend, my favourite place in the world and which should be on the Victorian Heritage Register. The weather was absolutely perfect: a still night, not cold. The crowds were there- probably the biggest turn-up in all the time I’ve been going. As you know, from my blog posts about Twilight Sounds in 2010, 2011, and 2013 I usually specialize in taking photographs of empty chairs at this gig, but not this year…. Excellent acts- all of them. Sweethearts first up- an all-girls big band from Geelong; then Emma Donovan (excellent!!) followed by Miss Murphy (who apparently won The Voice, but as popular culture tends to pass me by, I’d never heard of her). Much laughter and fun was elicited by Anna’s Go-Go dancing, when she had probably 700 people up dancing, with their Saturday Night Fever moves and Hillsong Hands waving in the air. Terrific idea; great fun. 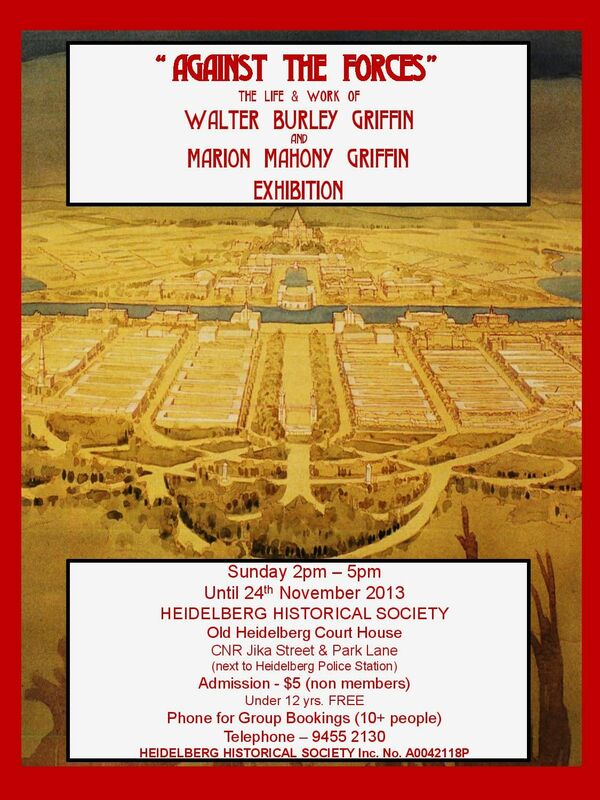 Then bright and early on Sunday morning, there I was all ready to march in the Arty-Farty Parade down Burgundy Street, representing Heidelberg Historical Society. What do we want? HISTORY! When do we want it? YESTERDAY! Oh, you mean it’s not that sort of march? After milling around on the oval for a while, waiting for the festival to be officially opened, over we trotted to Sills Bend itself which was all set up for the Arty Farty Festival. Heidelberg Historical Society had its annual Bus Tour that afternoon and this time we headed off across town to the Essendon Incinerator. Yes. An Incinerator. The Essendon Incinerator was designed by Walter Burley Griffin and opened in 1930. It was one of 13 that Griffin designed in Australia – seven of which are still standing- and the only one left in Victoria. The post-WWI influenza epidemic had raised anxieties about the dangers of tips, and when a young engineer called John Boadle invented a new form of incineration, it attracted the attention of a number of councils. Called the ‘reverbatory incineration’ technique, it involved dessicating the garbage before firing it at 2000 degrees in a closed furnace whose heat was intensified by being bounced back or ‘reverberated’ from a brick arch. The process generated little smoke or smell. This is inside the building, under the hoppers that led to the incinerator unit. The garbage was conveyed onto the site in trucks which drove straight into the building. The load would be tipped into hoppers and hot air piped over it to dry out all moisture. Gravity dropped it into the incinerator where it would be fired, with the ash raked out from the bottom. Heat from the process was used to make and heat bitumen made from the ashes. 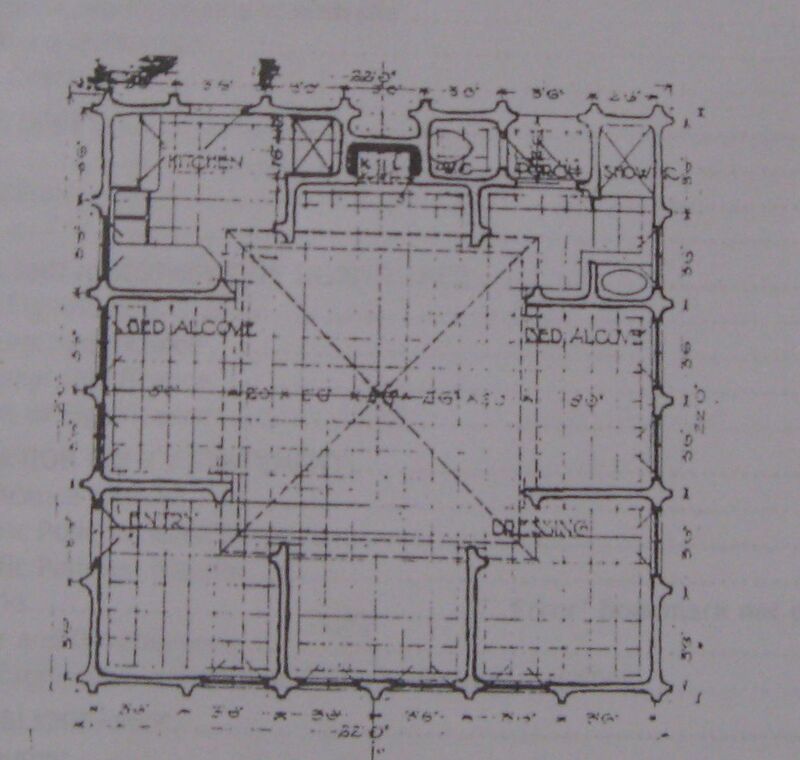 The showers provided onsite for the workers (which was rather revolutionary at the time) were heated by the incinerators, and the hospital used the heat to sterilize bedpans. The incinerator is on the site of the old Essendon tip. No-one wanted the incinerator built near them, and when it was argued that the people already living near the tip had paid cheap prices for their land anyway, it was decided to build it there. However, the first very bland and ugly design for the incinerator caused an uproar, and so Griffin and his partner Nicholls were called upon to redesign it. And so they did. The building is quite beautiful- almost churchlike. It has many Griffin-esque touches like the raked roofline, cut-out geometric shapes in the windows, interesting plumbing details, and the use of reinforced concrete. Despite its innovative design, it was not used for long. It required fuel-injection to light the incinerators and during WWII, shortages of fuel forced them to stop using it. After the war, they commencing tipping again into landfill sites, and the incinerator was not used again. It’s fortunate that it has survived: many of them have not. Neighbouring Brunswick had one, but it has been demolished. The most famous one was at Pyrmont, and there was much unhappiness when it was demolished as its chimney was one of the landmarks of the harbour. The incinerator at Willoughby has been turned into an art centre, as has the Essendon one. It’s surrounded by trees and is a beautiful building. You can read more about the Griffin incinerators here. A couple of weeks ago, Heidelberg Historical Society was delighted to welcome Professor Janet McCalman to our open meeting to speak about the Founders and Survivors Project. This is a fascinating partnership between historians, genealogists, demographers and population health researchers who are using the convict records of the 73,000 men women and children who were transported to Van Diemens Land (VDL) between 1803-53 to create a collective biography of the transportation experience as it played out through succeeding generations. Not particularly “Heidelberg-y”, you might think, but you’d be wrong: from among the records she found three ex-VDL convicts who settled in the Heidelberg/Diamond Creek/Whittlesea district, and in many ways their lives illustrated the ‘lifestories’ approach of the project as a whole. The Van Diemens Land records are one of the most complete databases of the bodies and lives of an entire population in the world- so unique that it has been placed on the UNESCO Memory of the World Register in 2007. The Founders and Survivors Project links them with another parallel database: that of those who served in the AIF in World War I. These two data banks form the bookends of a project that looks at the convicts as a population, rather than as individuals, gathering data on their lives before sentence from which to infer their early life influences, examining their progress through the penal system in VDL, then tracing their lives after sentence. It moves onto succeeding generations, looking at the occupations, life span, families, mobility and social location of their descendants ending up, if possible, at the AIF records. Using the methodology of prosopographical demography, it is a project built up from small records into an over-arching collective biography. The convict indents are a starting point, but it widens out to genealogical records, shipping records, newspapers and institutional records as these individuals move through different life stages. As you can imagine, this is a hugely labour-intensive process, involving records from all over the world. In a way that just would not have been possible twenty years ago, the grunt-work of the project has been crowd-sourced, with local historians, family historians and genealogists from all over the world making their contributions. You can see a video and read a transcript of Janet giving a talk similar to the one she gave us here at the State Library of Victoria website. The people of Port Phillip during Judge Willis’ time liked to pride themselves on belonging to a ‘free’ society rather than a penal colony. 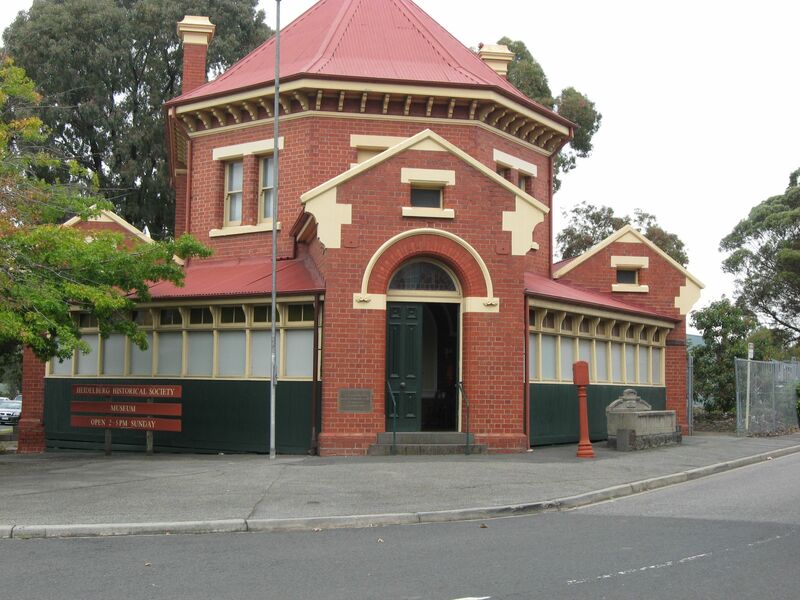 However, as I wrote about here, there were many convicts in Port Phillip, and through the Founders and Survivors project, they have established that many of them were attracted to either Melbourne and its suburbs or the goldfields. I was not surprised to learn that of the ex-convicts they were able to trace to death (just under half), the majority of men did not marry, but I was surprised to learn that 30% of women did not marry either. Moreover, the majority of the women they have traced did not have children, although as Janet explained, a large tranche of the earlier female transportees were street-walkers whose venereal disease may have affected their fertility. One of the criteria that the project has used for ‘success’ in later life is the presence of grand-children. Grandchildren suggest that the former transportee was able to carve out a life that was sufficiently secure to raise children to adulthood, and that those children, in turn, were able to find life partners with whom to start their own families. It puts the present-day pride in convict ancestors into another light: as far as VDL convicts are concerned, those who went on to sprout forth large family trees were very much the exception rather than the rule. Two comments that she made struck me in particular- probably because they have resonances with events today. The first was that of the punishments inflicted during transportation, solitary confinement seemed to be correlated most strongly with poor life outcomes, with fewer marriages and children afterwards. Physical punishment (e.g. lashing) declined over time, as the system moved towards more psychological punishment. Women in particular suffered from transportation (or the life prior to transportation), with their life expectancy some ten years lower than that of free settler and native born women. The second observation that Professor McCalman made was that it was government activity that gave many of these ex-convicts a leg-up. Many were employed on the railways, and moving beyond WWI, those who served in the AIF and received returned-service homes managed to avoid the worst of the depression. Many from later generations worked on the large infrastructure projects- Yallourn power station; roads etc. In a world today of for-profit, public-private partnership, it underlines the importance of government activity in infrastructure, not just in its construction but its ongoing operation as well. This project combines big-picture analysis with fine-grained family stories. There’s a wonderful, beautifully-designed site called Founders and Survivors Storylines that presents these family stories through video, song and words. Well worth a look.